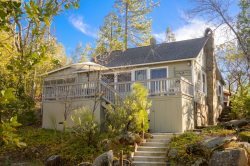 A perfect place to escape near Yosemite! Welcome to Cedar Peak, an classic A-Frame cabin where you’ll experience the magic of mountain life with modern amenities that are perfect for families. Centrally located with easy access to restaurants and grocery stores. Just 10 minutes from Bass Lake and 20 minutes from Yosemite’s South Gate. Bedroom 1: Ah the master suite. A favorite room in the house for its king-sized bed, fluffy comforter, and crisp white sheets and pillow cases. A comfortable bench is at the foot of the bed for changing or relaxing. A walk-in closet offers all the space you need to unpack, while a sliding glass door offers access to a private back deck (pssst….a neighborhood deer family is often spotted from here). Bathroom 1: Just off the master suite, behind a sliding barn-style door is a brand new bathroom. It is newly remodeled and features ample storage, double sinks, new toilet, and a tub/shower. We love this bathroom for its spaciousness and ease of use with children (bath time anyone?). Fluffy white towels, shampoo, conditioner, body soap, and a hair dryer are all provided. Loft: A favorite place to sit with a cup of coffee, the loft has a futon and coffee table that makes it easy to take in the mountain views. The futon also converts to a queen bed in case you need an extra place to crash. Sheets and pillows for this extra sleeping area are always included and available to you on-site. P.S. Another favorite thing to do up here? Build a blanket fort with the kids. Just saying….. Bedroom 2: The first downstairs bedroom offers a queen-sized bed with crisp white linens, french doors leading to the backyard, a full closet, a luggage rack, modern lighting, and a ceiling fan. Bedroom 3: Full bed with crisp white linens, full closet, luggage rack, modern lighting, and ceiling fan. Bathroom 2: The downstairs bathroom features slate tile flooring, double vessel sinks, ample storage, a new toilet, and a luxurious rain shower (it’s amazing - you have to experience it!). Also provided fluffy white towels, shampoo, conditioner, body soap, and a hair dryer. Laundry: Full-sized, high efficiency washer and dryer are available for your use. Complimentary laundry soap and dryer sheets are also provided. Living room: The living area features soaring ceilings and a giant wall of windows, a classic A-frame feature and our favorite part of the home. A sofa and two chairs offer a place to cuddle up in front of the fireplace or enjoy a movie on the flat-screen TV. WIFI is complimentary and Netflix for your use, as well as a dvd player with a selection of movies for you to enjoy. Note: the television is a smart tv, so you are welcome to access your own streaming subscriptions during your stay. Kitchen: This fully stocked, modern kitchen has everything you will need for your stay at Cedar Peak: stove with double oven, extra large refrigerator/freezer with filtered water, pantry, dishwasher, toaster, coffee-maker, microwave, and a full assortment of cookware, serving dishes, plates, utensils, and drinkware, not to mention a griddle perfect for slinging pancakes family-style. We also provide complimentary food wrap, tupperware, and foil for your use during your stay. BBQ: A 5-burner gas grill is available to you on the front deck just off the kitchen during your stay. Bring your meats! There’s no easier way to feed a big family than by throwing it all on the grill. Dining: The home accommodates seating for 8: four at the main dining table and four at the countertop bar (we also have a high chair available if you need it! Just let us know upon booking). If we haven’t convinced you that Cedar Peak is the perfect fit for your family by now, let us just also mention this: the A-Frame is professionally cleaned and managed, meaning that you can be absolutely sure that you will arrive at a home that lives up to the photos, is sparkling clean, and that a staff that is available to help you with anything you need during your stay. Essentials: Wifi, TV, Heating, Towels, bed sheets, soap, and toilet paper. Ryan was very helpful and made sure we were taken care of. We loved the cabin. Perfect size for 6 people.